The Meltemi line consists of a complete assortment of matte finish opal cased-glass lighting fixtures in timeless architectural forms. The triplex casing insures an even, luminous appearance. 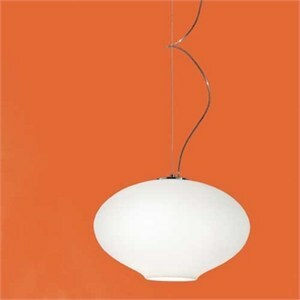 The Anita Pendant is one of Meltemi's newest additions, though it evokes a retro feel with its graceful curves. Provides ambient as well as direct light. Dimensions 21.5" D X 13.75" H; 59" maximum overall height, can be field shortened. Uses 1 X 150W 120V E26 (medium base) incandescent lamp (not included).